Create a visionary Conceptual Design for the 13th Avenue Axis to be a model of excellence in campus open-space design, reflect the Campus Plan principles and university values, and be a memorable part of the campus experience. The Project is being led by Walker Macy Landscape Architects along with their team of Gehl Studio, Toole Design Group, KPFF, and Capital Projects Group and will create a visionary conceptual design for 13th Avenue through the University of Oregon to be a model of excellence in campus open-space design, reflect the Campus Plan principles and university’s values, and contribute as a memorable part of the campus experience. The Owner intends to retain the services of a leader in campus open-space design to lead the Project. 13th Avenue is a major axis within the University of Oregon campus open-space framework and is the primary east-west corridor for pedestrians and bicyclists through campus. However, the visual character, circulation patterns, and levels of safety vary throughout the axis. Visually, the axis looks and feels like a typical street designed for automobiles, even where portions have restricted vehicles access. Currently, the western portion of 13th Avenue (Kincaid Street to University Street) gives pedestrians and bicycles priority, restricting vehicle access to service and emergency vehicles. However, the extremely high volume of pedestrians and bicycles, along with service vehicles and crowded transition areas, can make the experience feel chaotic and unsafe. The eastern portion of 13th Avenue (University Street to Agate Street) attempts to limit personal vehicle access, but not successfully. Drivers dropping off passengers or looking for parking continue to circulate amongst the high volumes of pedestrians and bicyclists. The eastern-most segment of 13th Avenue (Agate Street to Franklin Boulevard) is a city street. The Campus Plan and past studies have identified opportunities for enhancement of 13th Avenue to improve visual character, gateways, circulation, and universal access. However, without a holistic conceptual design that recommends specific improvements it is not possible to understand how to move forward with implementation. The Project will provide the basis for future design and implementation phases. Following the conceptual design Project the Owner may elect to continue with schematic design for all or parts of the Project with the hired consultant as a separate contract. Prioritize pedestrian and bicycle safety and circulation while providing for emergency and service access needs as well as special event uses. Address broad and complex site considerations that include multiple building entries, bike and pedestrian corridors, limited vehicle access, gateways, etc. Eliminate the visual and functional impact of the original use as a vehicular thoroughfare. Preserve existing mature trees and landscapes. Promote universal access throughout the corridor. Implement applicable principles and recommendations of the Campus Plan, Framework Vision Project (FVP), and past studies into site specific designs. Develop a conceptual design that can be implemented in phases as stand-alone projects. Engage the campus community to identify needs, opportunities, and refine Project goals. Implement strategies for stormwater treatment and sustainable design. Accommodate the full range of uses throughout the Project area including special events like the ASUO Street Fair. 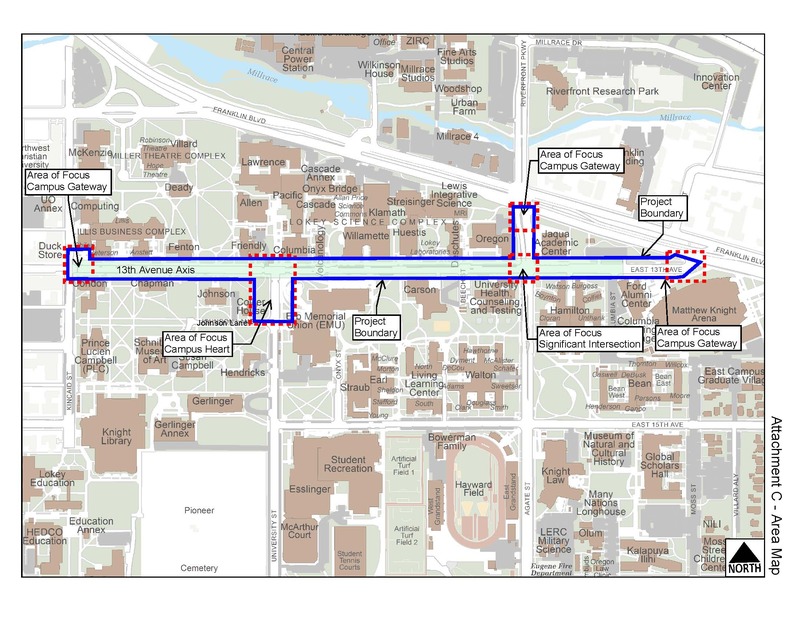 Enhance campus gateways, the Heart of Campus (13th Avenue and University Street), and significant intersections to improve safety, wayfinding, and circulation. Tie into the broader site context (beyond the Project boundary). It is anticipated the conceptual design project will be complete around May 2019. If you would like more information or have any questions or concerns, please contact Campus Planning directly (Aaron Olsen, aaolsen@uoregon.edu, (541) 346-5564).